For twelve-year-old Emily, the best thing about moving to San Francisco is that it's the home city of her literary idol: Garrison Griswold, book publisher and creator of the online sensation Book Scavenger. Upon her arrival, however, Emily learns that Griswold has been attacked and is now in a coma, and no one knows anything about the epic new game he had been poised to launch. But when Emily and her new friend James discover an odd book, they're sure it's from Griswold himself, and might contain the only clue to his mysterious new game. Racing against time, Emily and James rush from clue to clue, desperate to figure out the secret at the heart of Griswold's new game—before those who attacked Griswold come after them too. I enjoyed it. Let's start with that. Besides the fact that the main character loves books and is named Emily, I thought she was believable and likable. 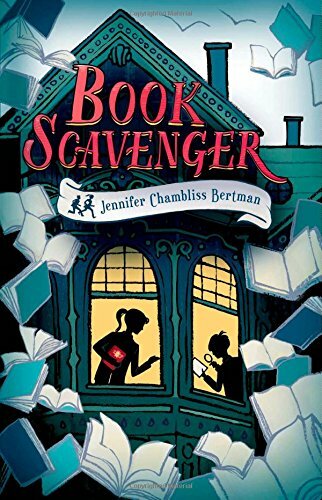 Unlike Escape from Mr. Lemocello's Library (which Bertman's book will be compared to throughout its life—unfortunately, because Bertman's is much better), the main character is not simply solving a game. She's dealing with best friend issues and figuring out what it means to be a friend. She's dealing family issues and identity. There's a bully at school she despises. I could go on, but the point is: Emily has depth and I appreciated that. If it had simply been about the puzzle, I don't think I could've finished the book. But don't get me wrong—the puzzle is fascinating, too. Mainly because it ties in actual location history (San Francisco) and actual literary history (especially stuff surrounding the life of Edgar Allen Poe) that it becomes fun and educational. So I definitely appreciate the book. It's not my favorite, because it can be a tad childish, but still recommendable. Better readalikes than Escape from Mr. Lemoncello's Library would be other puzzle mysteries like The Westing Game.